Have you been looking for puzzles to challenge the brain? This alphadoku puzzle, using letters rather than numbers (similar to Sudoku puzzles) is a unique way to activate problem solving strategies while using basic Sudoku rules to solve the puzzle. 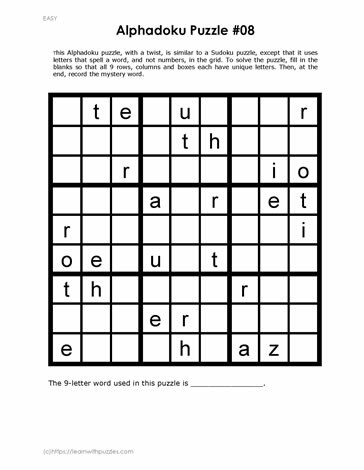 Once the grid has been completed, record the 9-letter word used in the puzzle. Suits students in middle grades 7,8,9 classrooms and home schools.